Revington TR developed high pressure pump kit based on a Bosch pump and pressurised filter. Including an on/off tap connected between the petrol tank and the first feed hose. Externally mounted, (although the photo shows the same kit internally mounted) this kit replaces the Lucas fuel pump and filter system with a neat arrangement consisting of a Bosch high pressure pump, non-return valve, gauze filter, pressurized filter, 3 stainless steel braided hoses with aluminium aircraft quality fittings, clamps and rubber mountings. At the time of writing we have not heard of this system failing due to hot weather over heating. 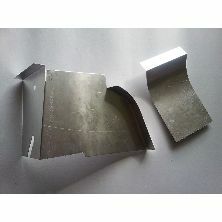 Now considered to be the Industry standard, Revington TR developed this kit after a series of unsatisfactory results with other Bosch conversions. This system was designed in conjunction with local Bosch experts and takes into account all the requirements of the Bosch pump, i.e. 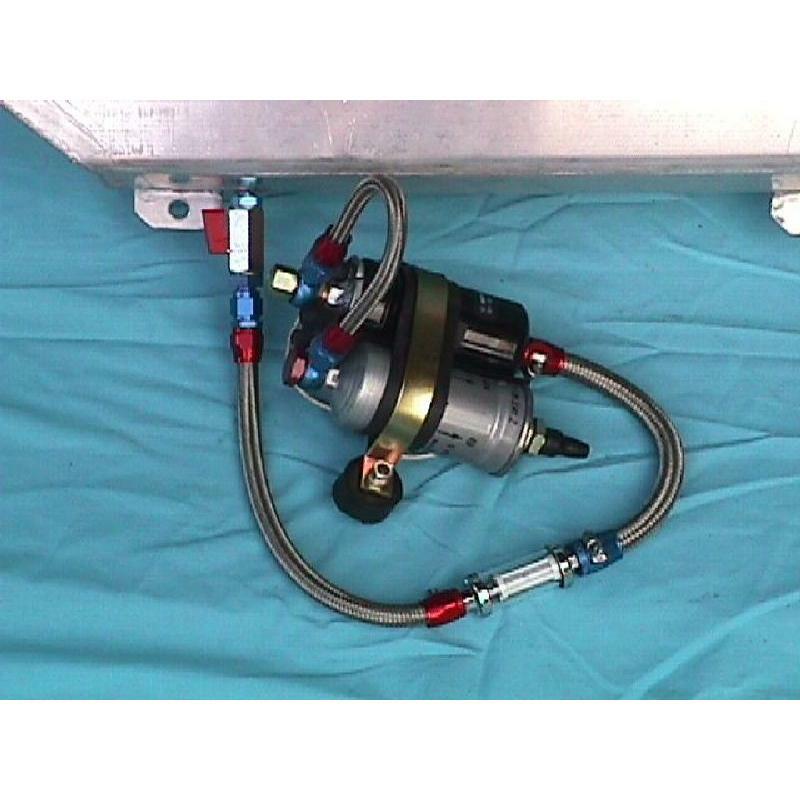 its position, feed rate, position in the fuel system and filtration needs. A more detailed information sheet IS0006 is available to download; please see below. The unit is mounted externally to limit the petrol vapour smells in the boot, always a problem with stainless braided rubber hoses. 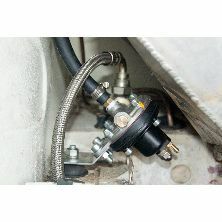 An on/off tap connected between the petrol tank and the first feed hose is included. As the filters require cleaning in the case of the glass filter and replacing, in the case of the high-pressure filter, this tap makes the job easier and less messy. It is not recommended to use this tap as an anti-theft device as running the pump inadvertently with the tap closed can damage the pump. NOTE 1: This kit must have a good electrical supply capable of passing 13 amps. The original car wiring is not adequate as the Lucas pump only requires 3.5 amps. 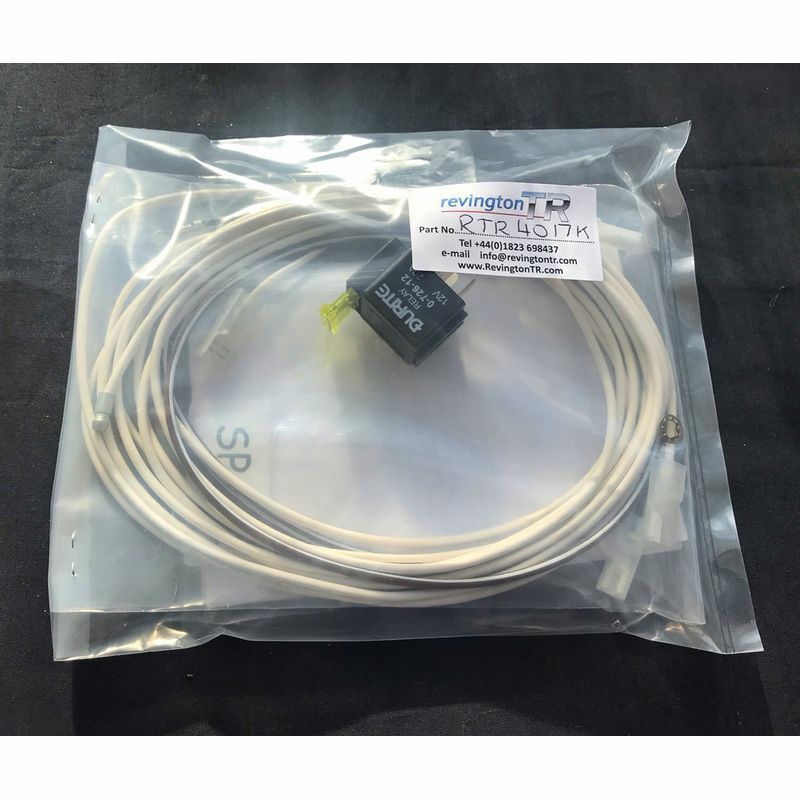 We can supply a relay and wiring kit part number RTR4017K. See below. NOTE 2: TR5 and early TR6 cars did not have an anti-surge reservoir in the petrol tank. 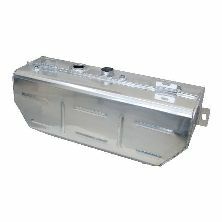 Cars fitted with this type of tank will experience fuel starvation on tight left hand corners with less than a quarter of a tank of fuel. Our replacement tank fitted with the correct anti surge reservoir, part number 312359AL or 312359XALK should be fitted to remove this annoying symptom. NOTE 3: Fitting RTR4050XK should take about three hours. NOTE 4: When fitting kit RTR4050XK outside the bodywork, shield RTR7259 may be useful. NOTE 5: Also consider hose RTR4048 to the PRV which helps to reduce resonance. 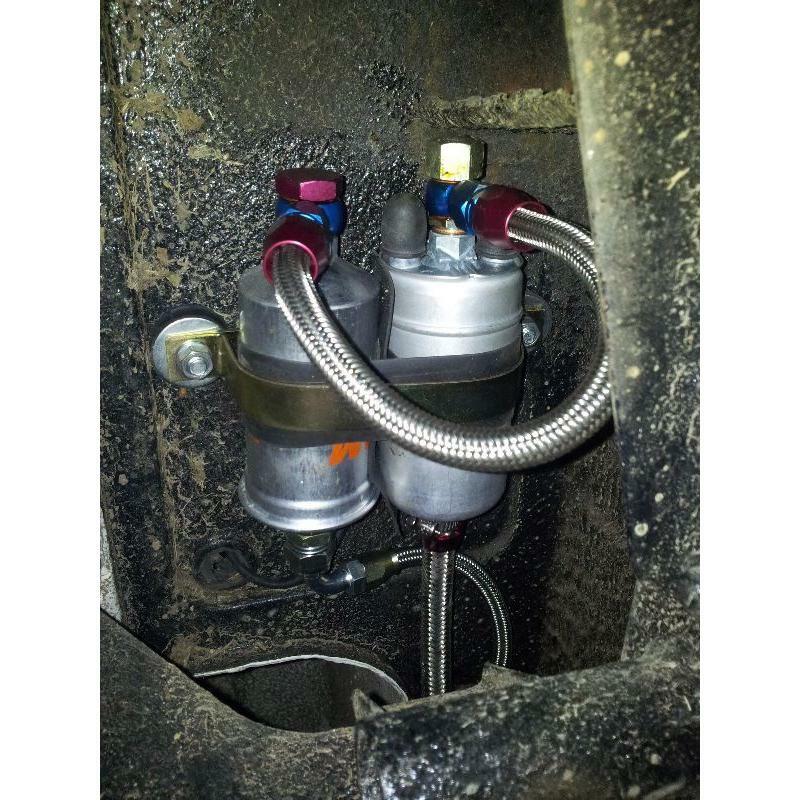 Resonance is when the Pressure Relief Valve (PRV) fluctuates at a resonant frequency with the pulses generated by the fuel pump and an unpleasant droning noise is produced. This phenomenon is unlikely to occur with the original Lucas pump but is very likely when a Bosch pump is fitted. A longer soft hose RTR4048 from the pump to the original PRV usually cures this (a stainless Steel braded hose will make it worse) but brings with it another bit of bad news. As modern fuels are much more volatile than older fuels they can permeate through rubber hose and create an unpleasant smell in the boot. If this is unacceptable there is a definitive solution to all this. We have a modern PRV available RTR4456K which works on a different principle to the original type and does not resonate. The good news is that a Teflon lined Stainless Steel braided hose (either 215642SS RTR4048-1) can be used from the pump to the PRV which will greatly reduce petrol smells in the boot. Before ordering 215642SS or RTR4048-1 inspect your Bosch fuel pump installation and choose the most appropriate hose. If you have a Revington TR Bosch fuel pump kit mounted externally under the left hand boot floor, 215642SS is likely to be your best choice. 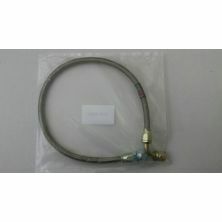 Hose 215642SS comes with one end loose so that it can be orientated correctly then tightened firmly. This is useful when using this hose to connect our external Bosch fuel pump kit RTR4050XK to the PRV. We recommend this hose in this application as it fits best with a pump shields and/or underwing shields. If your specific applications requires a longer hose use RTR4080-1. This part is listed on the following pages of the website, where further information and background reading may be found. 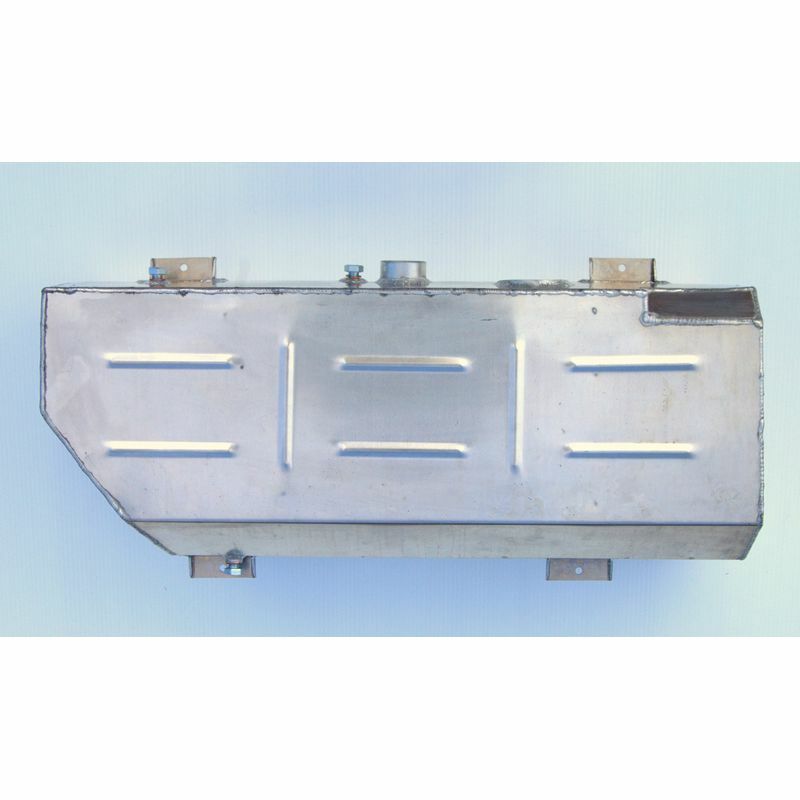 Revington TR information: This standard capacity aluminium Fuel Tank is a basic level multi-application unit with outlets to cover TR4, TR4A, TR250, TR5, carburettor TR6 and Petrol Injection TR6. Revington TR information: This tank includes all the correct internals for use with petrol injection (PI) both mechanical and electronic as well as carburettor cars. 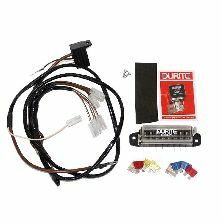 Revington TR information: TR2-8 (or any car of any age for that matter) Auxiliary Fuse Box and Loom kit. 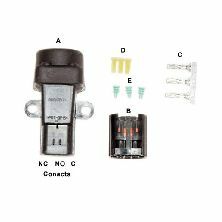 This kit provides 8 extra fuses, 4 supplied directly from the battery and 4 ignition controlled via a relay. Revington TR information: Canister fitter. Replacement Filter kit consisting of 1 x RTR4012, 2 x WC21420202 sealing washer and 2 x WC21217142 sealing washer to aid fitment. Revington TR information: This Pressure Relief Valve (PRV) kit replaces the original PRV found in TR5's and TR6's and as it is of a modern diaphragm design, cures many problems inherent in the Lucas Mechanical Fuel Injection system. Revington TR information: TR6 Return Hose, stainless steel, screw type, metering unit to return solid pipe. Revington TR information: This fitting may have a different size across the flats to the one you remove but the thread size is the same. Revington TR information: 7.5mm I/D rubber petrol hose/metre R9 ethanol resistant. 14.6mm o/d. Revington TR information: Hose Braided Stainless Steel from petrol pump to Pressure Relief Valve (PRV) TR6 where the PRV is at the left hand side of the petrol tank (many TR5's will have been converted to this arrangement). Revington TR information: Rubber Hose 648mm (25") long with a straight union at one end and a 90 degree union at the other; suitable for use with RTR Bosch Pump Kit. N.B. See note regarding fuel smell. HOSE TEFLON LINED SS BRIADED. 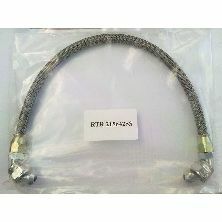 Revington TR information: Teflon lined, stainless steel braided Hose 648mm (25") long with a straight union at one end and a 90 degree union at the other; suitable for use with RTR Bosch Pump Kit. Revington TR information: Modern Inertia switch kit modern version, much more reliable than the original TR6 item. A must for all Electrically Pumped fuel systems. Revington TR information: Relay kit for Bosch pump when fitted to TR5-6. The pump wiring on these cars is intended to run the original Lucas pump, which only draws about 3 amps.